I am a big fan of winter squash, even more so now that some island-grown varieties are becoming available, including one of my favorites: butternut squash As with many things in Hawaii, butternut squash can get to be an expensive buy at the grocery store, especially considering that most squash weigh several pounds. So, whenever there is a sale, I am the crazed woman buying 5-10 at a time. They keep pretty well for several weeks, even in a tropical climate, and I can always cube and freeze a few if I can’t get to them before they would go bad. 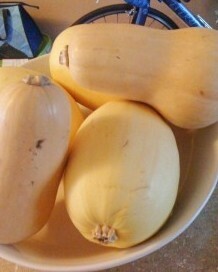 Butternut squash is a great option if you are trying to keep you calorie and carbohydrate intake in check. It is a flavorful and filling way to add a lot of substance to a meal; I often use it in place of sweet potato. When you compare the facts: 45 calories & 11g carbohydrate in 100g of butternut squash versus 86 calories and 20g carbohydrate in 100g of sweet potato, it’s easy to see how this substitution can add up to results. Butternut squash also contains significant amounts of vitamin A, an antioxidant that protects and improves the health of your skin and eyesight and may protect against lung and oral cancers. So how can you get some of this great stuff into your diet? Roasted, with olive oil, salt and pepper is a classic favorite, but there are a ton of options. I really like the spice flavor combinations in this Moroccan stew. You can always add chicken, lean beef, or tofu to bump up the protein. I eat this with quinoa instead of couscous; I’d rather have a whole grain. These top 5 recipes from Oh She Glows all look creamy and comforting, perfect for the chilly weather we’ve been having. You could even make a hummus! Who doesn’t like a dip? Do you have a favorite butternut squash recipe?